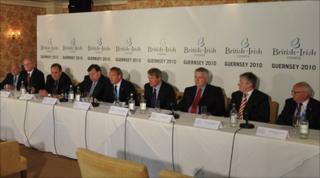 The British-Irish Council vowed to continue to work together to accelerate the marine renewable energy sector. Guernsey politicians hosted the meeting of representatives from England, Ireland, Scotland, Wales, Northern Ireland, Jersey and the Isle of Man. They said sharing best practice and research into marine renewable energy had benefited them all. Experts have said the seas around the British Isles could provide up to 50% of Europe's renewable energy. Peter Robinson, Northern Ireland's First Minister, said: "While there are initial high costs, I think the more research and development that we have, the more that we share we can drive down those costs and I think for the future this is the way to go." "We have been experimenting, we put tidal wave technology into Strangford Lough, that was the first in the world that was commercially driven and directly linked to the grid." The SeaGen system was installed in Strangford Lough in May 2008 by Marine Current Turbines. Among its backers are Guernsey Electricity, which is owned by the States of Guernsey, demonstrating the council's aims in action. Tony Brown, Chief Minister of the Isle of Man, said: "One of the problems is the energy that is potentially available and the technology that isn't maybe quite there yet. "One of the big advantages of coming to the British-Irish Council is that we're getting that kind of information, we're able to work with colleagues in the other jurisdictions to see how we can move forward." In the agreeing of a communique for the summit, which included the economic climate, housing, and indigenous languages, the council decided to set up a standing secretariat to better progress the council's work in-between summits. This has been on the agenda since 2007, but at this summit it was agreed the secretariat would be based in Edinburgh, with its operation and how the costs are shared being worked out at a later date. The council was set up under the terms of the Northern Ireland peace agreement for the various governments to discuss matters of mutual interest and first met in 1999. Owen Paterson, Secretary of State for Northern Ireland, and Charles Hendry, Minister of State for Energy and Climate Change, went instead.